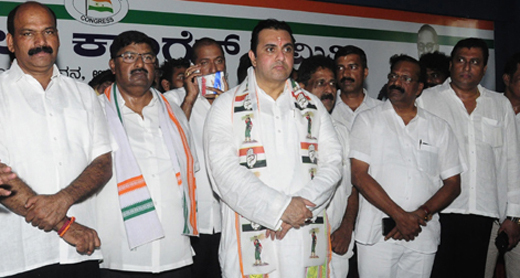 Udupi, Mar 25, 2019: Former Udupi MLA and former Congress leader Pramod Madhwaraj who is fighting the Lok Sabha polls from Udupi-Chikkamagaluru constituency as a Congress-JD(S) candidate, filed his nomination on March 25, Monday. As per the pre-poll seat sharing agreement, Pramod is a coalition candidate of the constituency. Speaking at a meeting of his supporters at the Congress Bhavan, he said he was happy to contest from the JD (S) and vowed to fight communal forces. He also assured to work for the betterment of women, farmers and youth along with DK Congress candidate Mithun Rai and Shivamogga JD(S) candidate Madhu Bangarappa. State Minister K J George, Udupi district in-charge Minister Jayamala and other leaders who were present said that the Congress and the JD(S) would put up a united fight to defeat the BJP.